Gruber Pallets offers a variety of used and recycled pallets as affordable alternatives to new pallets. Contact us to learn about how we can help you ship. Gruber Pallets offers a variety of used and recycled wooden pallets as affordable alternatives to new pallets. Here are pictures of our most common inventoried recycled pallets. Every pallet is sorted, inspected, and repaired to meet the quality standards of our customers. For sizes that we do not routinely stock, we build custom remanufactured pallets using reclaimed lumber from dismantled pallets. We also provide Heat Treat services for any of our pallets that need to be compliant with federal export requirements. A recycled pallet is any pallet that has been used before, and it may have repaired stringers or deckboards. In fact, the majority of pallets in circulation have been reused or repaired. Here are some characteristics, advantages, and disadvantages of using a recycled pallet compared with using brand new. Capacity Recycled pallets can hold anywhere between 1500 and 3000 pounds which is largely influenced by the way the product is distributed on the pallet. 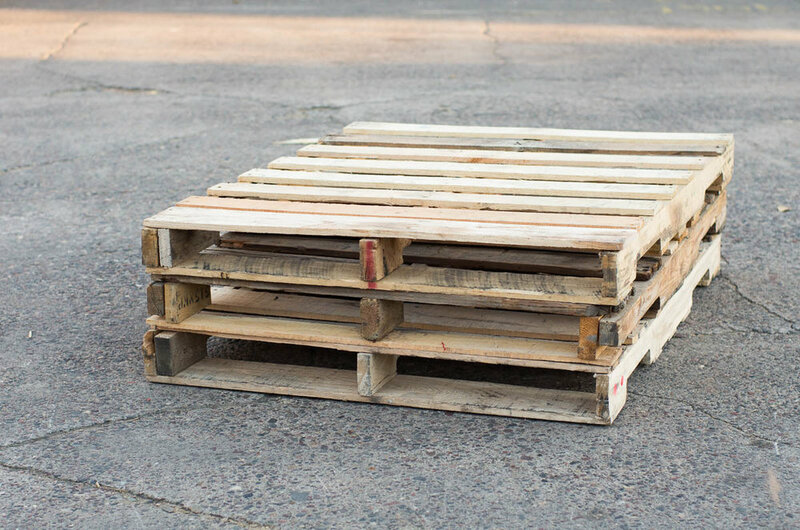 Pallets will hold more weight if the item is evenly placed, whereas pallets with concentrated loads in one particular area will not be nearly as sturdy. Classifications Most companies will sort recycled pallets using a few key identifiers 1) dimension, 2) number of stringers, and 3) amount of repairs on the stringer - some companies will even sort pallets based on whether they are heavy-duty or light-duty. It is standard in the industry to use terminology of "#1 Grade, #2 Grade" while some refer to their pallets as "A Grade, and B Grade." Reduced moisture By virtue of a longer lifespan, recycled pallets have more time to dry and typically register 15% moisture content or less, while a new, "green" pallet can carry 25% or more moisture content. Dry pallets limit the opportunity for moisture to move from the pallet through the paper or cardboard packaging surrounding the product that needs to be shipped which could damage the packaging and also damage the product. Secondly, dry pallets are not as easily susceptible to mold. Moisture is one of the primary ingredients for mold growth, and so a dry pallet is at relatively low risk for attracting a mold spore and housing its growth. Pricing Recycled pallets are significantly more cost effective than brand new pallets. Based on national averages, recycled pallets tend to cost about 40 – 60% of the price of their new pallet counterparts. Inconsistent quality Because recycled pallets are collected from various locations, there is always the possibility of inconsistent quality in deckboard spacing, stringer or deckboard thickness, or nails that are not perfectly flush with the deckboards. Another disadvantage is the difficulty tracing exactly where each pallet has been. There is no pallet recycler that can absolutely guarantee where each pallet has been on each step of its illustrious pallet career. While many companies might not need to know this kind of information, a clean history is typically a concern for companies in heavily-regulated industries that deal with products like infant formula, powdered food ingredients, etc. Limited supply Recycled pallets also undergo a cycle of short supply. Because a pallet recycler can only sell pallets they have picked up and repaired, recycled pallets are limited by the number of pallets available on the market. About every 3-5 years, the pallet industry undergoes an ebb and flow of having more pallets available than there is demand, and then not enough pallets to go around. A recycled pallet will hold a couple thousand pounds, they will stay dry, you will not know exactly where it has been, but recycled pallets do a great job of taking a simple product and transporting it from Point A to Point B.